Product prices and availability are accurate as of 2019-04-13 13:57:46 UTC and are subject to change. Any price and availability information displayed on http://www.amazon.com/ at the time of purchase will apply to the purchase of this product. The posts on this triangular stilt measure 2-1/2 inches long and are 2 inches from each other. The stilt is suitable for firing items such as eggs, ornaments, small figurines and similar. 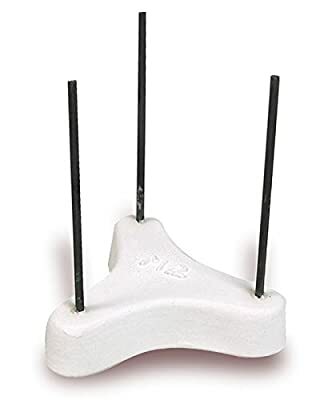 It has a maximum firing temperature of 2025 degrees F. and is an essential accessory for ceramic and pottery hobbyists and professionals, schools, institutions, and paint-your-own pottery shops that need to kiln-fire taller objects.